It’s not as good as THE CORRECTIONS, but it’s still better than 95% of the books I’ve read in my life. Sometimes its worthwhile to read an author’s lesser work, because it helps show you exactly what you liked about that author. For instance, THE CORRECTIONS is a lot more funny and humane than FREEDOM. In THE CORRECTIONS, it felt like these were ordinary people who were struggling a little bit and might’ve gotten caught up in some stuff that was a bit beyond their control, but they weren’t really bad. In FREEDOM, the characters are just lost. Utterly lost. Nothing can save them. They’ve given up on being good people. They’ve just given up. 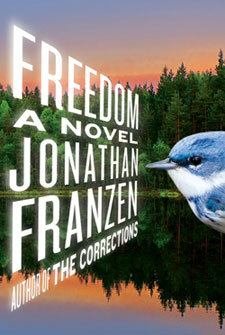 And it’s also clear that Jonathan Franzen just absolutely hates these people. He doesn’t spare them at all. There is not an ounce of mercy. He hates them so much that it doesn’t even come off as satire or caricature. People are always like, “Oh, J Franz loves to make fun of dopey midwesterners.” But I am not sure that is it at all. I do not believe that these people are somehow representative, even in his mind, of the Midwest. I don’t think he’s saying that these people are awful, but people in New York are somehow great. No, he’s just saying that people are awful. Period. They are all awful. Unredeemably awful. And they all deserve to be tortured. There is something so profoundly misanthropic here. And what makes it worse is that the people he selects are so well-intentioned. They try so hard. And he always goes deep into the psychology of their dysfunction and tries to establish exactly how and why they went wrong. But in the end, it doesn’t matter. There’s still no mercy. Even if you know exactly why a person’s soul is ugly, it doesn’t change the fact that they’re hard to look at. And I love it. I really love it. There is a fierce aliveness to these characters. They fully inhabit their own lives. There is so much drama inside one tiny, rather-unremarkable family. When you read a book like this, it rejuvenates the world and makes life worth living, because it shows you that ordinary experience has the potential to be outsized and dramatic. I liked this one too! Especially all the parts that had to with the Iraq war and the anguish of trying to be a good environmentalist. I really liked the mom’s autobiography. I think it was because she was so confused and so sure that she was a bad person. And you start off being all like, no, you’re not bad, and then the poison eventually overwhelms you and you start to see her as she sees herself.